American foulbrood is a disease of honeybee larvae caused by the bacterium Paenibacillus larvae. Beekeepers should ensure their apiaries are free of this disease to prevent reduced production and dead beehives. American foulbrood disease is caused by bacteria and is transmitted through spores. Very young larvae are highly susceptible to infection. As few as 10 spores can infect a larva less than a day old. Infected larvae are killed by the bacteria before pupation and at this stage as many as 2.5 billion spores per larva may be released. These spores may survive at least 40 years. They are resistant to drying and boiling in hot water. The spores may be introduced through contaminated equipment from other hives or from another bee colony by contaminated ‘robber’ or drifting bees. Unsterilised tools may also be a source of contamination. Young larvae swallow the bacterial spores in infected food from nurse bees. The bacteria multiply in the larval tissue causing rapid death, and the spores are spread to other larval cells as well as the honey cells by worker bees attempting to remove the dead larvae. Eventually, numbers of adult bees decline and the hive becomes weak and dies out. Bee colonies usually abscond (swarm) when this happens. This dead hive may attract robber bees from neighbouring hives which can spread the disease further. The first signs of American foulbrood are sunken and damaged cappings on the sealed brood. The dead larvae turn yellow at first and then chocolate brown and are drawn down into the cells. On stirring with a probe such as a matchstick, the contents of the cell may rope out forming a characteristic fine elastic thread up to 30mm long. In more advanced stages of the disease, the larval remains become tacky and gradually dry out to a dark brown scale. Good lighting is required to observe these scales as they are similar in colour to dark brood combs. 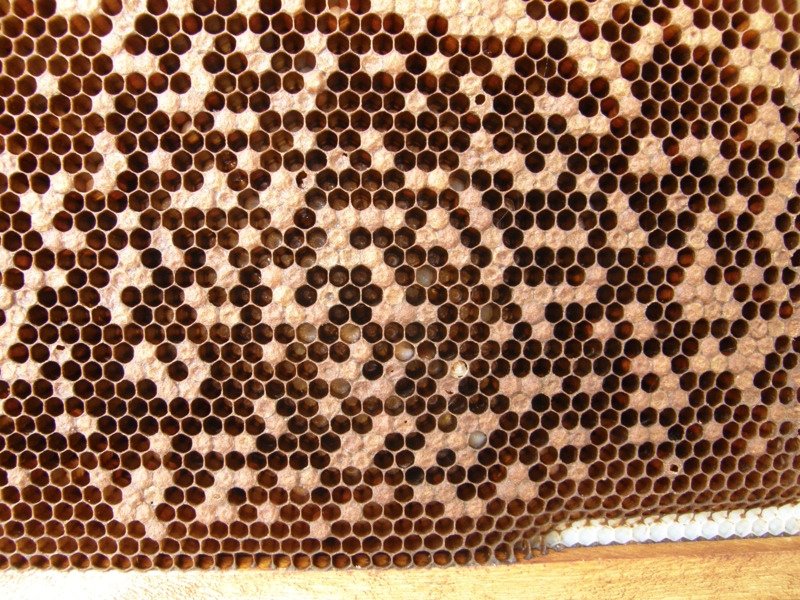 Whenever a colony dies out or an irregular pattern of brood is observed, the combs should be examined for sunken and perforated cappings or dried larval scales. If anything resembling them is found, a sample of comb and larvae should be submitted immediately to the Department of Agriculture and Food for laboratory examination. The remaining combs should be left in the hive. 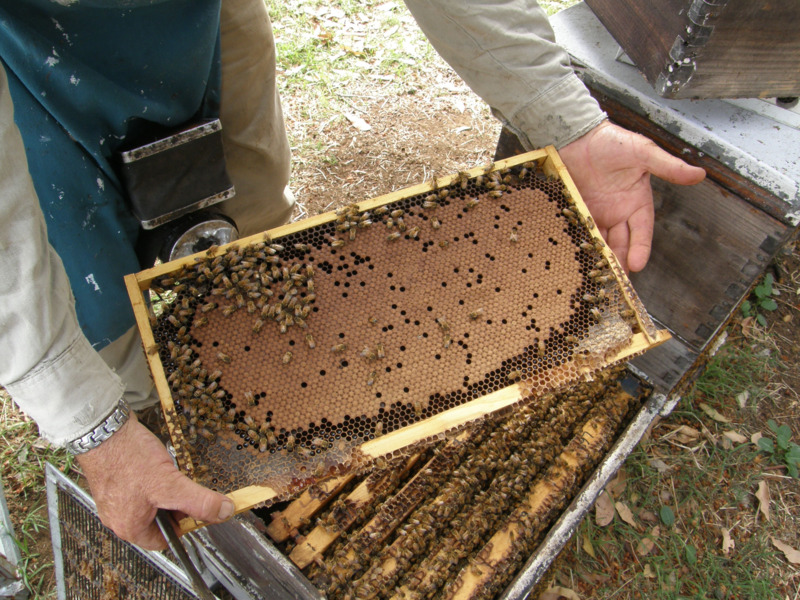 The hive should be physically identified and made bee-tight until a report on the condition of the sample has been received. Note: An apiary inspector must be notified within 48 hours of suspecting American foulbrood. If foulbrood is identified, the beekeeper and an apiary inspector will agree on a management plan to eradicate the disease from the apiary. All brood will be inspected and diseased hives removed before honey extraction and movement of hives. Hives can still be moved to their normal honey or pollen sites with permission of the inspector. Diseased hives can be either decontaminated by irradiation or wax dipping, or destroyed. Some hive components can be decontaminated using 1% sodium hypochlorite. All boxes, including frames and lids, should be thoroughly cleaned — that is, made free of honey, bees, brood, propolis and wax — before any decontamination is attempted. This initial cleaning does not decontaminate the equipment. All honey, dead bees, scrapings and brood frames (as well as hive components that are not to be decontaminated) removed during the cleaning process need to be disposed of so robbing does not occur. Burning at night is a good choice. Use a hole big enough to cover the remains. When boiling water is used, the boxes need to be placed in the container so the wax and residue float to the surface and can be skimmed off. Turn boxes upside down to assist in removal of the debris when heat treatment is used. Remember to scrape out the rebated edges. Honey can be salvaged from infected hives. However, if only a few hives are infected, the honey should be burnt with the frames and the infected brood. Immediately clean the extraction shed or van and equipment when extraction is completed. Pay particular attention to the extractor baskets. Soak them overnight prior to final cleaning and then use high-pressure wash-down equipment. If using a van, wash-down water should be led to a drainage hole in the ground near the van to trap the waste water. The hole should be immediately covered after cleaning is completed. At night, the entrances to infected hives should be sealed with wads of newspaper or masking tape, and an insecticide introduced into the hive to kill the bees. Wait for 48 hours after extraction before killing the bees in the hive. Bees often congregate around the entrance of the hive rather than enter it on the first night following extraction. Place all boxes, frames and equipment (including lids and bottoms) from infected hives in plastic bags before they are taken from the site for decontamination. Where practical, scrape bottom board debris and any excess burr-comb off the boxes before the equipment is put into the bags. It is recommended that 200L drum liners (1.1kg) be used. Seal the plastic bags and store them in a bee-proof shed. If a bee-proof shed is not available, an undercover storage area could be used provided the bags are covered with tarpaulin and secured at the edges to provide a bee-proof barrier. While frames can be sent for irradiation, brood and wooden frames are difficult to clean properly so should be burnt. Wax-dipping of frames is not an effective method of decontamination. Lids should be irradiated or burnt. The wax-dipping process increases their weight because the masonite component of the lids absorbs the paraffin wax. 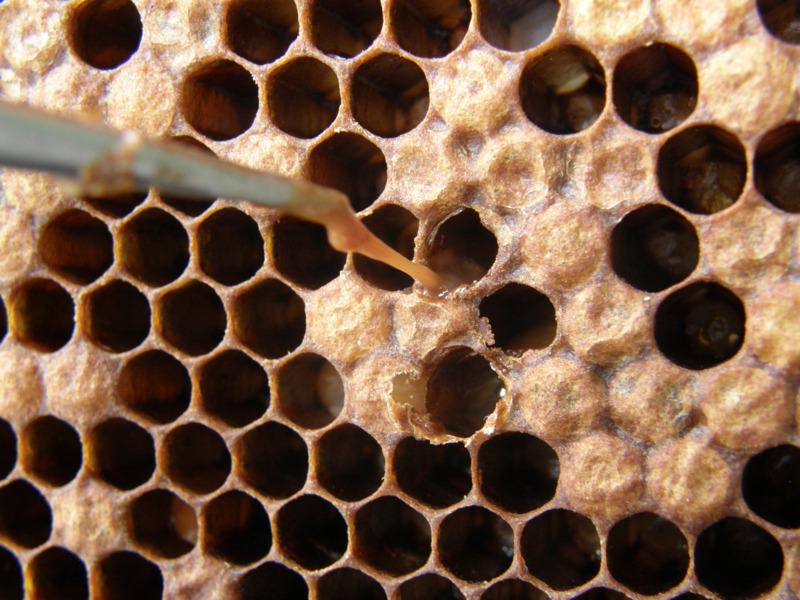 In addition, when wax-dipped lids are re-used, the trapped wax can melt and run down the outside of the hive in hot weather. High-rise bottom boards, bottom boards and internal grates made of masonite or wood should be irradiated or burnt. Metal bottom boards can be decontaminated by irradiation, wax dipping or steam cleaning or by being dipped in 5% sodium hypochlorite and placed in boiling water for more than 10 minutes. Any metal contact with hypochlorite needs thorough rinsing otherwise it will corrode. Where a pallet is used to form the entrance of a hive it should be decontaminated using a blow lamp/torch. Plastic queen excluders cannot be cleaned effectively and should be irradiated or burnt. Metal excluders can be cleaned and decontaminated by irradiation, steam or the use of sodium hypochlorite as for metal bottom boards. Gamma irradiation is an effective treatment for killing spores. The gamma rays penetrate cells and break down DNA strands so bacterial growth cannot occur. It leaves no residue and the bee equipment can be re-used immediately. The hive boxes must be thoroughly cleaned on the outside (use a high-pressure hose) prior to being stacked into doubles or triples with the lid and base. The unit must be double-bagged or shrink-wrapped so that it is sealed, then strapped tightly together. Each unit should not weigh more than 25kg. The units can then be stacked onto a 1200mm x 1240mm pallet. The height should be less than 2m and the whole thing not more than 1000kg. Beekeepers should clearly label each box for easy identification. The pallets must be transported to the irradiation facility in a bee-proof container. Contact Steritech for more information. If hive components are not thoroughly cleaned before wax dipping, the wax quickly becomes soiled and contaminated with paint and debris, shortening its useful life. The boxes should be dipped in a mixture of 50% micro-crystalline wax and 50% paraffin wax. The equipment must be submerged in the molten wax for a minimum of 10 minutes at 160°C to kill the spores. Use a timer and thermometer to ensure that decontamination is effective. Wax heated above 150°C can cause severe burns to exposed skin. However, wax under 160°C results in ineffective decontamination. Lower temperatures also result in more surface wax retained by the timber which subsequently decreases the holding power of any paint later applied to the timber surface. Do not overheat the wax as it will give a highly flammable vapour above 175°C and reaches flashpoint at about 230°C. Boxes to be dipped must be dry, as moisture will cause the molten wax to froth and boil over the vat. Identify the paraffin and crystalline wax so that it will not be mistaken for beeswax when the wax dipping unit is not in use. Remove the boxes from the molten paraffin and allow them to cool for one to two minutes. As soon as the excess paraffin on the surface of the box has been absorbed by the timber and the box is ‘dry’, but still hot, it can be painted inside and out with an acrylic paint or sealer. Painting the inside of the box is not necessary but it can help to keep the boxes free from burr-comb. Boxes should not touch each other while drying. Follow the manufacturer’s instructions when using a wax dipping vat. In cool weather it is advisable to dry and warm the boxes in a warm room as this will help to reduce frothing from moisture retained in the timber and assist in maintaining the temperature of the wax during dipping. Dispose of any debris in the bottom of the vat so bees do not have access to the wax residue. Wax dipping vats may be available for hire from beekeeping equipment suppliers. Identify all boxes with the date they were wax dipped or irradiated. This will prove helpful in the future should any outbreaks of disease be found elsewhere in the apiary.